Fab-Set is perfect as your carpet cleaning finishing touch. Fab-Set eliminates detergent residues, speeds carpet drying and makes colors really pop! It also prevents browning, gives carpet a wonderful, soft feel and returns carpet to the perfect pH for use or protection application. Ideal when used as a rinse in your portable or truckmount, Fab-Set can also be misted onto carpet as an after-spray. 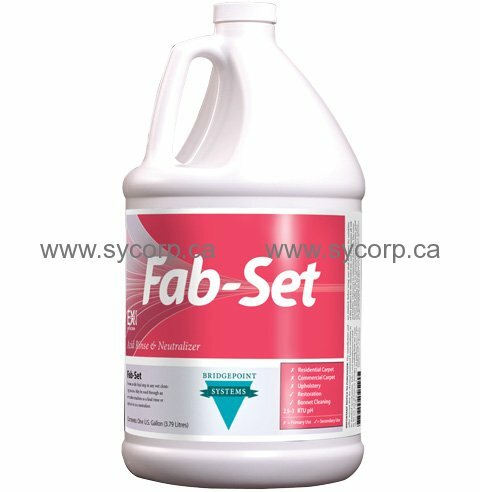 Fab-Set is also great when used with a bonnet to remove yellowing and browning or as a pre-spray on heavily foaming carpets. Anionic formula.